Okay, I know....I've seen worse, too...but it was most certainly not the clean-feeling, serene bathroom that Maple and I were wanting for our little house (the door is blocking the view of the built-in storage that used to flank the left-hand wall). 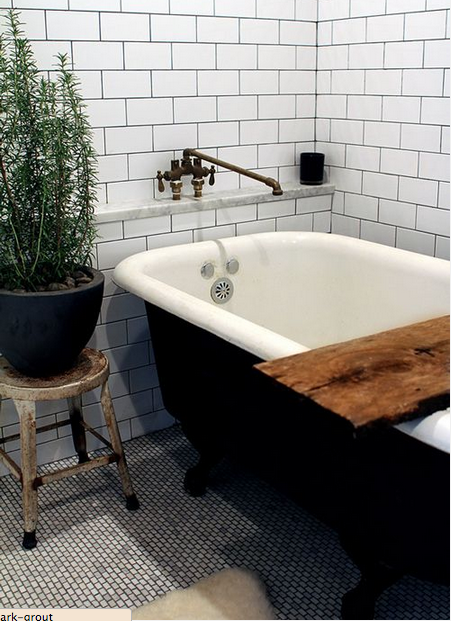 But that tub is cool, right? And the window...it's good and charming...especially now that its roller shade is in the trash. 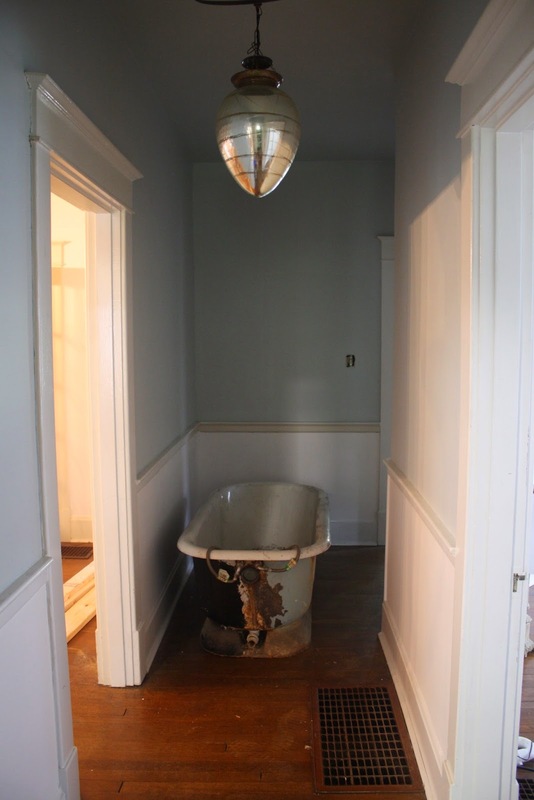 So, we initially decided we could live with a few minor upgrades, and someday make this bath into the bath of our dreams when we added onto the house. 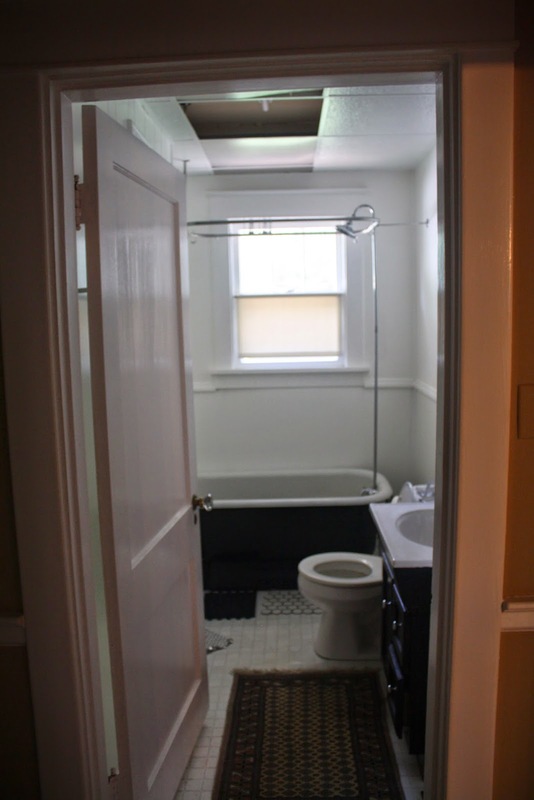 But for now removing the drop-ceiling, changing out the flooring, and installing a new vanity would suit. And then we removed the drop-ceiling. Long story short: the drop ceiling was covering terribly cracked plaster. We were expecting that, yes, but not to the extent that it was damaged. And, the paneling didn't extend to the ceiling...only to where the drop track was installed. To repair the ceiling and top section of the wall would've been a pain, and we would've still been living with dingy paneling. So off came the paneling. And with it the horse-hair plaster. 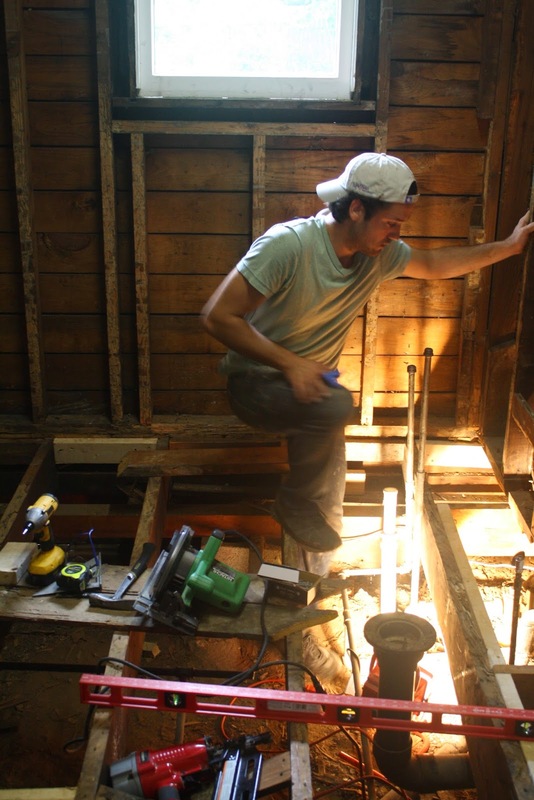 And with it the termite-damaged lath and wall joists. And the janky built-ins. the stained linoleum. And the water-damaged subfloor (which could've easily crumbled beneath the extreme weight of that cast iron tub, which is original to the house). You get the point--it ALL CAME OUT. And it feels SO MUCH BIGGER! Andddd out came the toilet. And my amazing handy Maple (and his equally handy brother) ran new plumbing and moved the toilet to the opposite side of the bathroom (where the built-ins used to live) to make room for a long vanity. Other pipes were replaced, and the subflooring was installed, and the tub was cleaned and recoated with black Rustoleum paint (90 years of cobwebs = not okay). Yep, the tub made its little home in the nook of the hallway for awhile. P.S. 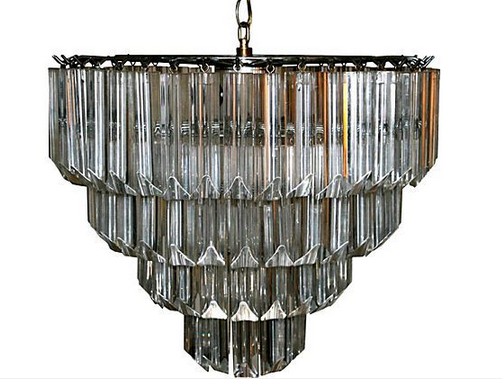 how cool is that mercury glass pendant light? Another one of those 'original charm' pieces we lucked into. We had to push the pause button on the bathroom while the hardwoods got refinished, but now we're in full-on finish it mode. Maple's been laying backer board for flooring tile, and prepping for other necessities. And I've been doing my research/planning/designing...trying to come up with a cost-effective aesthetic solution that looks super clean and polished and...not-so-cost-effective. I mean, that Darryl is just crazy brilliant...don't you agree? 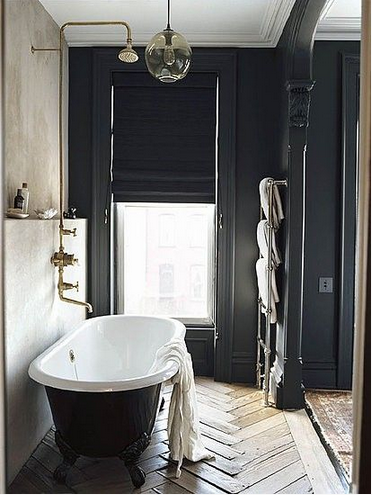 I've also found inspiration in these bathrooms...with their neutral palettes and black tubs (for that crisp, masculine design emphasis that's greatly needed). 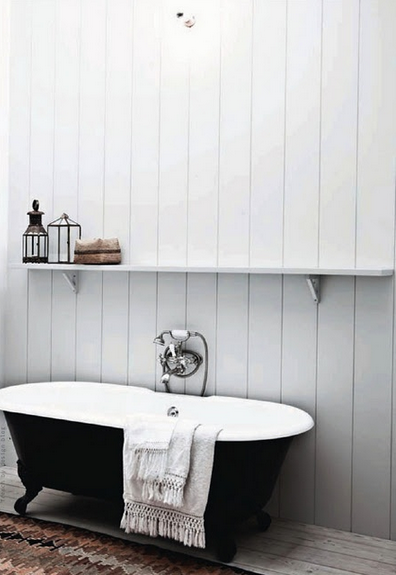 I also wanted to keep the tub black to really draw one's eye in and anchor the room, since mostly everything else will be in the white palette. 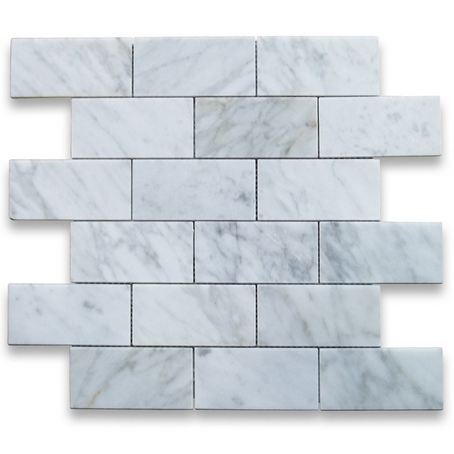 We finally decided that we'll be cladding the walls in floor-to-ceiling beadboard. Drywalling was our original plan...but it takes so long and creates such a mess. It's also pretty permanent. We eventually want to run plumbing to the upstairs, and add a master bathroom directly behind this one you are seeing, so we thought it best to leave the wall framing fairly accessible. Beadboard would be sort of easy to remove and reinstall when that stage of our house reno ensues. So beadboard the walls will be. 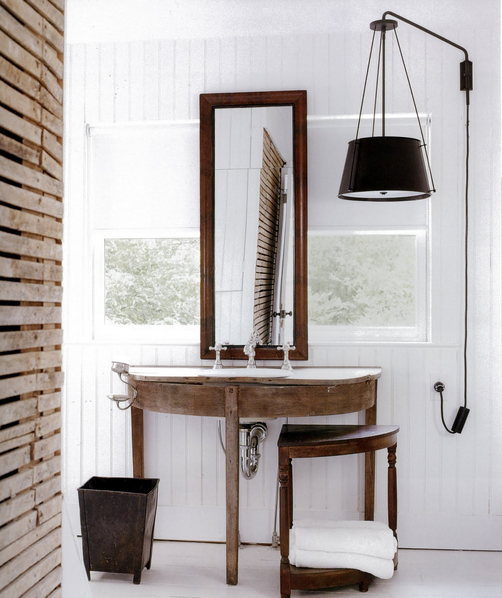 And a simple linen shower curtain will soften the room but keep things very natural, serene, and sophisticated. And someday in the near-ish future we will build-in some solid cabinets and shelves above the newly moved toilet to really enhance our storage capacity. And someday I will clad them with leaded glass door fronts (sigh)...much to the likes of this built-in inspiration above. 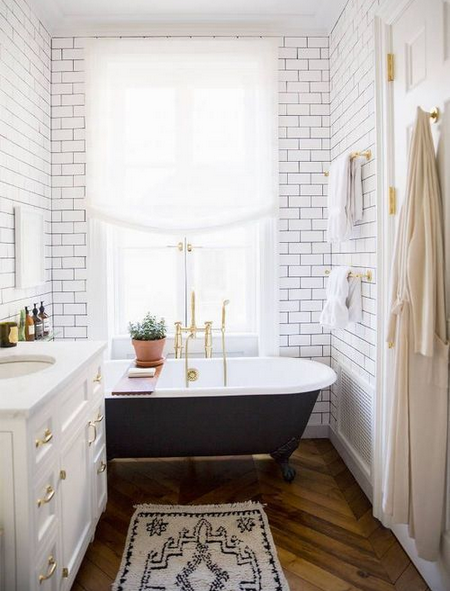 Those are gorgeous bathrooms! 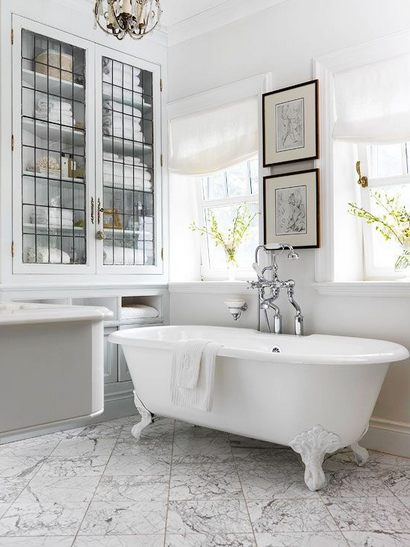 I would love to have a claw foot tub someday. 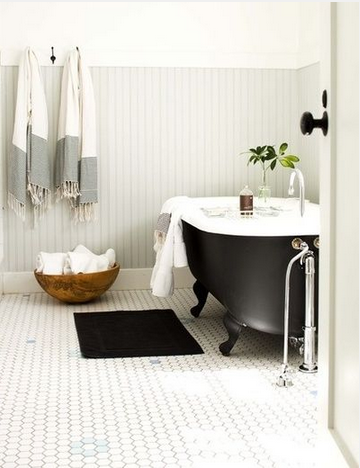 I really like the curved ceiling above the tub in that last pic too. I love your bathroom plan. It's going to be beautiful, airy, and serene.